And easy recipe for Banana and Custard Tart from Delia Smith's book How to Cheat. Whoop! Whoop! There is a new series starring Delia Smith, will be aired and there is a cookbook to go along with the series. This banana and custard tart is from the book. How to Cheat at Cooking is Delia's first book for five years and I am sure it will be well worth the wait! The recipes from the series and in the book aimed at when you don't have much time on your hands. I thought, well if it's good enough for Delia, it is good enough for me! Bananas and custard work so well together. For some of us it reminds of of nursery food as it is often served as pudding to babies and toddlers. And yes it's comforting and tastes so good together. Follow me on Pinterest for more ideas and recipes. Well there is some sugar and fat in there, but it is pudding so what do you expect. However it does contain lots of banana and they are good for us and definitely one of our five a day. 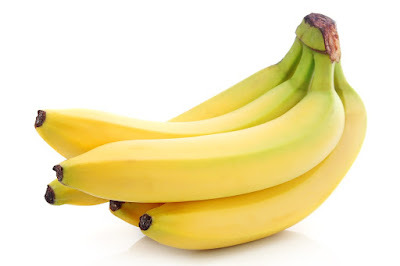 Bananas, which are botanically a berry, I know that's nuts right, are high in Vitamin B12 and Vitamin B6. They are also a good source of potassium and magnesium. They also contain protein and fibre. So lets concentrate on that! 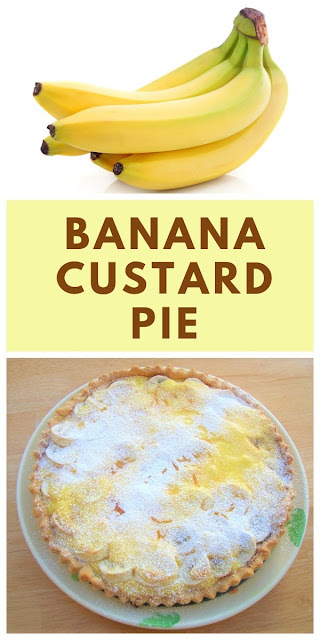 An easy recipe for banana and custard tart with shortcuts. Heat the oven to 180c/160c fan/350f/gas mark 4. Brush a loose bottom flan tin with a little melted butter. Carefully unroll the pastry and lay over the flan tin. It if breaks up, don't worry, just gather it together and roll out until it is a little larger than the tin. Fit the pastry carefully into the edges and cut off any excess. Cut a circle of greasepoof paper, again a little bigger than the flan tin, place on top of the pastry and weigh down with ceramic baking beans. Bake blind for 10 minutes. Turn the oven down to 160c. Remove the beans and paper, then bake again for another 10 minutes. Remove the pastry from the oven and allow to cool. Pour half of the custard into the pastry case and smooth over the base. Slice the bananas and toss in a little lemon juice. Cover the custard layer with the sliced bananas and top with the rest of the custard. Drizzle with a little maple syrup. Place back in the oven for another 40-45 minutes. If it looks like it is starting to brown, then cover with foil. Remove the tart from the oven and leave to cool. The custard will firm up as it cools. Disclosure: I bought this book myself and used my own quantities to replicate Delia's recipe as close as possible after watching the programme. I am sure it would be even better if it was made from scratch, but I can assure you it is darn delicious! That banana tart looks so good!! Bookmarked! Glad you like it Kevin! it is nice and simple! Banana and custard are such a great combination. I've always thought of custard as something that's difficult to make - we'll definitely have to give this one a try! I so like the looks and ingredients here - a must try for me. Mmm custard tarts! I've never seen custard in the store before though. Well I guess those Jell-O custards? Hmm. Oh yum! 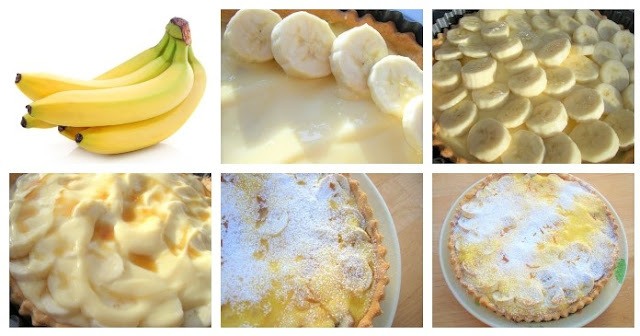 I make a bananna cream pie which resembles your except I put meringue on mine. Yours looks so nice and creamy! YUM to the TUM! I will have to look up Delia as I have not heard of her, but would like too with a recipe like that! I can't get enough of these cheating desserts - truly fabulous! Looks similar to a southern specialty...Banana Pudding. I will try to make this one. Gorgeous! The Brits have and always will excel at desserts, bravo wee lass! Gorgeous Holler! If it tastes as good as it looks, I'm sure it would be hard to resist going for seconds! What did you think of Dleia then Holler? I was half tutting it and half going, 'go on Delia!'. The food snob was appearing in me at times. Good stuff though. Hi Johanna, I didn't actually take it through with me, after speaking on the phone with my mum, it turned out she already had 2 desserts ready and waiting. So this is a trial run! I will make it for her another time. Banana Cream Pie sounds even more tempting Val! Hi Muse in the Kitchen. If you get a good recipe, then it is not hard at all. Try this recipe. Hi Giz. Thanks for visiting! It is a luxurious piece of pie! Hi Ashley, We are lucky, we have some lovely fresh custards sold in the supermarkets here and it does save some time! Thanks Pixie, but I don't even want to know why you are giggling! Hi Deb, Your pie with the meringue sounds excellent, have you put it on the blog? I would like that recipe! Hi Katerina, it does save a fair bit of time! Hi Foodgirl, Mmmm, banana pudding sounds good! Thanks Peter, That is a compliment from a man who makes such lovely desserts himself! Hi Lisa, I resisted, but Graham couldn't help himself! Hi David, I cringed through the programme! I liked her idea for a spring soup, that was fine, but ready Grated parmesan and frozen mashed potato is a step too far for me! Cringe! I will still probably tune in for the rest of the series and enjoy it though, just because it is Delia!